It's hard not to get caught up in Olympic fever. Every time you turn on the TV or radio or internet, there it is - some captivating image of someone's jubilation in triumph or despair in defeat. Of course, most of us here in New Zealand are by now suffering severe sleep deprivation, as most of the events are taking place in the middle of the night for us. It's hard to go off to bed when you want to watch just one more race ... oh, hang on, just one more ... okay, this is definitely the last one - you understand the scenario. Anyway, London seems to be doing a great job of hosting the games, and even if you are not a huge "sports nut", you can not help but find the skill and power, dedication and determination with which so many athletes participate uplifting and inspiring. Of course, the games will always have its detractors, and as I understand it the location of the Olympic park in London's East End, and its impact on that community has not found favour with many. One of the great tragedy's has been the loss of the Manor Garden allotments. The gardens were established in 1900 by Major Arthur Villiers to provide plots of land for local families in a deprived area to grow vegetables. Divided into 80 plots, a tight-knit community tended their allotments for over a century. Although, many plot holders have been long-standing East End families, newer plot holders brought a wide variety of ethnic backgrounds to the community. One couple to find themselves part of this community was Sam and Sam Clark, the couple behind London's Moro restaurant, and their book Moro East offers a collection of recipes that chronicles a year of life in this community garden. With the gardens having been demolished in 2007, this book is a real treasure documenting something which is gone forever. I have read that the gardens may be re-established after the games are over (does anyone know if that is true? ), but in my mind some things can never be regained. Anyway, Moro East is a wonderful book - I've borrowed it from the library on a number of occasions, and have it on my wishlist for adding to my collection. So why am I telling you all this. Well, apart from the fact that it's a story which I think is worth the telling, the recipe I'm sharing with you today is adapted from one which I came across in a recent issue of Cuisine magazine, and on reading the introduction to the recipe I noted that it was adapted from a recipe in Moro East. And that is the end of the story. Now, on to the food!! This dish could not be simpler to make. 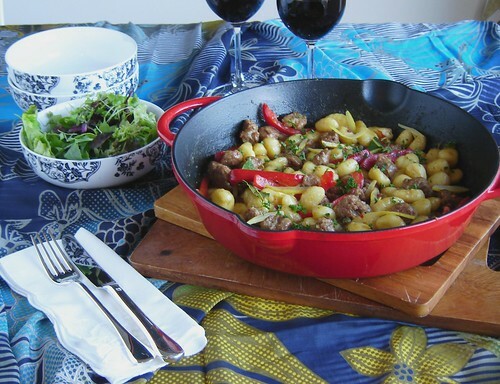 It is a one-pan-wonder which is totally my favourite kind of dish, both to cook and to eat. I used gnocchi instead of the potatoes called for in the original recipe, making this a dish that can be knocked out in about 10 minutes flat instead of half an hour. I was thinking to add in some chillies for a bit of extra heat, but then I noticed that my sausages were already seasoned with red pepper flakes, so instead I added in some red peppers, making this somewhat reminiscent of another of my favourite recipes from Lidia's Italy by Lidia Bastianich. 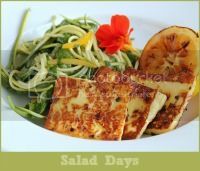 This needs nothing more than a fresh green salad on the side and a good glass of wine, to make a quick and easy dinner that is sure to become a real family favourite. Remove the sausages from their casings. This is easily done by just running a sharp knife down the full length of the sausage, then peeling the casing away. Then break the sausage meat into bite-sized pieces. Set a large, heavy-bottomed skillet over medium heat, and add a tablespoon of olive oil. As soon as the oil is heated, add the sausages pieces. Move them around in the pan from time to time, and when they look as though they are half-cooked, add the red pepper strips. Sprinkle with a small pinch of flaky sea salt (be restrained, as there will be saltiness from the sausages, chicken stock and preserved lemon), and continue cooking until the sausages are brown and crispy and the peppers softened. Remove from the pan and set aside. Add another couple of tablespoons of olive oil to the pan, and then add the gnocchi. Stir them around to coat them all in the oil, and then fry for a few minutes to brown a little. You will get bits that stick to the bottom of the pan, but those little stuck bits soon become little crispy bits, and they will all lift when you add the chicken stock and help to make the sauce. As soon as the gnocchi have browned a bit, add the sausages and peppers back into the pan, stir to combine, add the bay leaf, and then pour in 1 cup of the chicken stock. Stir and scrape the bottom of the pan to loosen all those stuck bits, and keep stirring as the liquid thickens. If needed add the remaining 1/2 cup of stock. Remove from the heat. Discard the flesh from the preserved lemon, retaining just the peel. Thinly slice the peel and stir into the pan along with capers. Sprinkle parsley over the top and serve immediately. 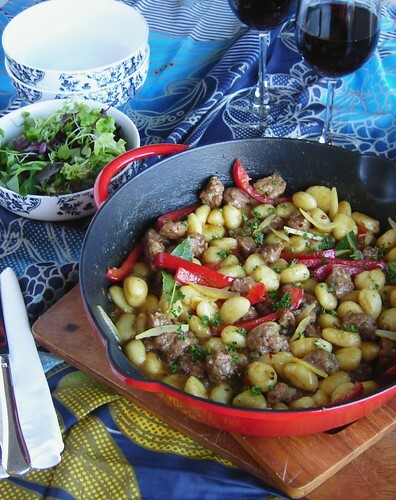 This dish ticks all the classic comfort food boxes, while the spicy heat of the sausages coupled with the little hits of preserved lemon and capers elevate it to something less ordinary than just sausage and potatoes. I hope you'll give it a try. Moro East, and other Moro cookbooks are available from Amazon in the US, Amazon UK, or Fishpond in New Zealand. This week I'm sharing this post with at Gallery of Favourites hosted by April at The 21st Century Housewife and at See Ya in The Gumbo hosted by Michelle at Ms. enPlace. well now, I'm curious - did it serve 2 or 4 at "your" house? Sorry... I got on a soapbox there for a moment. Gnocchi is just about my favorite starchy thing to eat these days. I've been making it by the bucketfuls for the past month... that looks wonderful! Totally admit it - only two - and in actual fact if I'm really, really honest, it was only one person - but I did eat it for two meals!! Soapbox fully excused, Toby - I agree with you - it happens everywhere and it's not always for the best. I never ate gnocchi much until fairly recently, but I'm seriously addicted to it now. This looks awesome! You took the humble sausage and made it a star! Can't wait to try it. Thanks so much - hope you enjoy it. I love the Italian Sausage/red pepper combination. This looks delish! Thanks, Pattie - Italian sausage and red pepper is a pretty unbeatable combo, isn't it?! Thanks, Alli. Yes, I think it's very sad, and you're right - having the space to grow a few veg is something we really take for granted - we don't realise how lucky we are. I love the Moro East cookbook. It's one of my favourites but I had no idea those allotments had been bowled for the Olympics. Very sad. Given your choice of cookbooks, can I recommend Mr Wilkinson's Favourite Vegetables by Matt Wilkinson. His Melbourne cafe, Pope Joan has recently been awarded Best Cafe Food by the Melbourne Age. I ate at his place last week and bought the book. It's gorgeous; not entirely vegetarian but lots of good vege recipes. Hi Anna - thanks for stopping by and thanks for the cookbook recommendation. That cafe sounds wonderful, and I'm definitely on the lookout for that cookbook now. thanks for sharing this story - I haven't read a lot about the olympic site but the loss of allotments sounds sad. Hi Johanna - it is a sorry story about the allotments, isn't it?! The gnocchi really worked as a substitute for the potatoes in this dish, and meant that time for getting dinner to the table was virtually halved. Has really nice texture too. This would definitely work well with veg sausages, or even tofu I think if you felt so inclined. 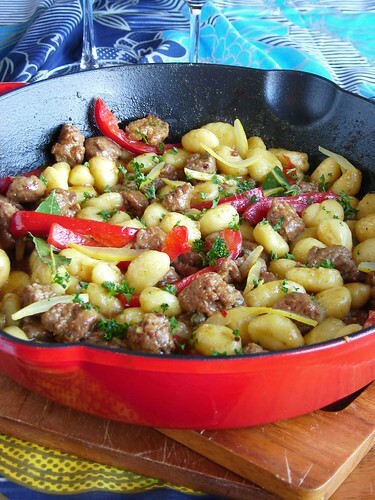 Your Italian Sausage with Gnocchi and Red Peppers sounds so delicious, Sue! I love dishes like this, easy to put together, tasty and perfect for everything from a family supper to a dinner party! You've summed it up perfectly, April. Since posting this, I've now made it several times - it's the perfect "go to" dish for all sorts of occasions. That is a story worth telling. Funny how at one time community gardens were all the rage. Now, not so much. Olympic fever ran through my house. Lots of late nights (and by that I mean 11 PM--which is late for me). But I found myself mesmerized by sports I never dreamed I would watch. Will probably have to double the recipe--I know we will be gluttons with this one. Thank you for linking this week! This looks so incredibly comforting and delicious - I can't wait to try it! Thanks for visiting - I hope you try it - I'm sure you'll love it. I have all the ingredients so I'm planning to make this tonight. One question --- no need to cook gnocchi in boiling water first? I guess it cooks in the chicken stock? Hi Bridget. Yes the gnocchi cooks in the stock, really only takes a few minutes. No need to boil it first. Hope you enjoy the dish. Planning on making tonight! But no need to boil the gnocchi first? Does it cook in the chicken stock? I made this for the SRC posting this month. It was amazing. We are adding it to the regular rotation of dinner options.